All transactions are safe and secure with a reliable history in online purchasing behind each of our associates. Buy the Karate Kid Movie Logo shirt to own Karate Kid clothing and merchandise. This vintage tan tee features a distressed style Karate Kid movie logo on the front. On this official logo, we see a silhouette of Daniel in the crane kick position with the rising sun behind him. 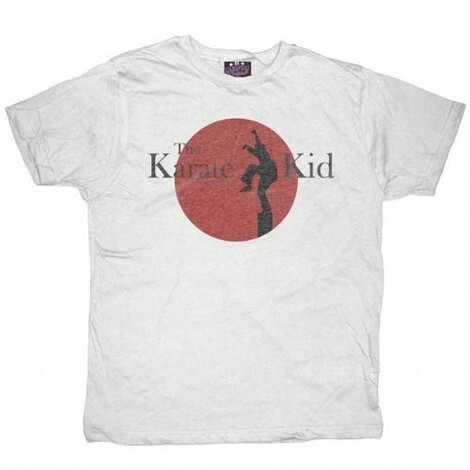 This is a bestselling Karate Kid t-shirt, as its connection to the movie is unmistakable. The 100% cotton tee is great for any fan of the 80's movie. Put it on and practice your crane kicks. In addition to the Karate Kid Movie Logo tee above, browse the Karate Kid Clothing Gallery for more apparel like men's and women's clothes, kids shirts or hoodies.